Monday 26th found us up at 7:30am after a very good sleep. After the usual clean up, shave etc. 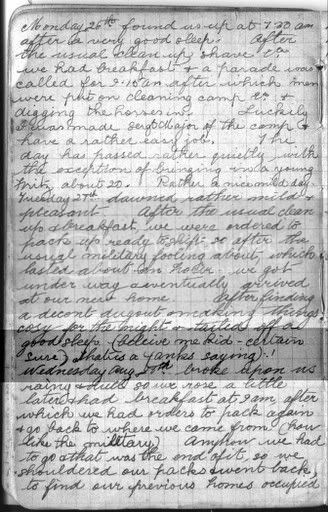 we had breakfast & a parade was called for 9:15am after which men were put on cleaning camp etc. & digging the horses in. Luckily I was made Sergt Major of the camp & have a rather easy job. The day has passed rather quietly with the exception of bringing in a young Fritz, about 20. Rather a nice day. Saturday 26th dawned with low cloud; it seems that the grassfires are putting enough particles into the air for fog and low cloud to form from the higher humidity. Today will be much running around - across town to pick up Mum D, then the shopping, and a few other errands. That trip across to the Logan Tavern (Qld Scrabble Tournament) and back was close on 80km, mostly motorway driving. Ouch. Took my daughter's little red car, so that injected an element of fun into the trip.